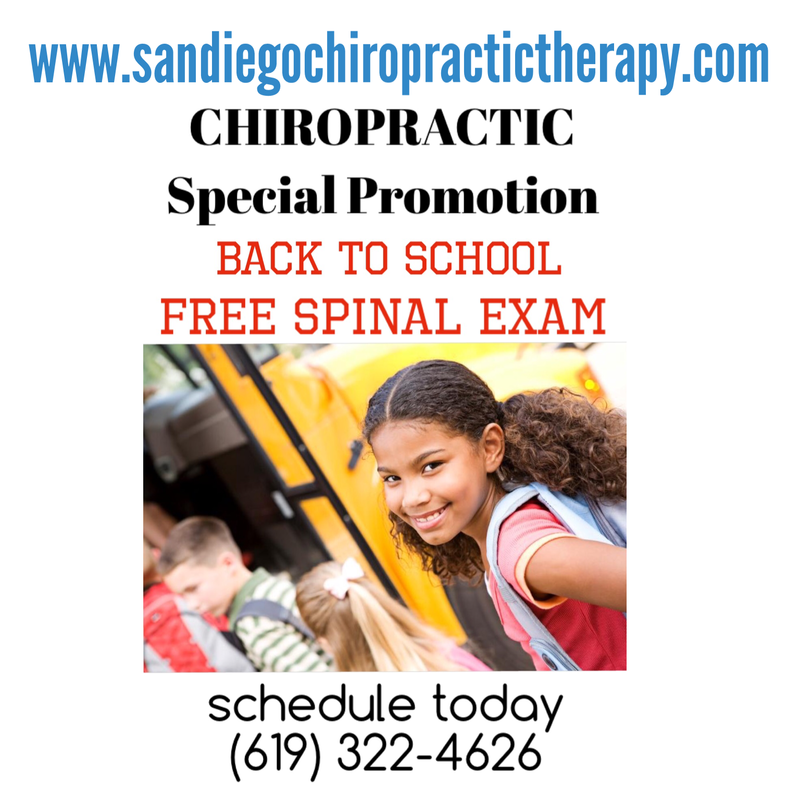 August Special - DiSabatino Chiropractic & Rehab, Inc in San Diego, has a policy that your children (under age 18) are entitled to a Back to School FREE Exam. A child’s spine is the most neglected part of their health care. Children often need chiropractic care more than adults due to heavy backpacks, frequent falls, injuries, computer & hand held cell phones, etc. Scoliosis, poor posture, & spinal problems can only be corrected at a young age and many more can be prevented, as well as maintained. Just as parents take their children to a pediatrician and dentist, regular spinal check-ups with a chiropractor are equally recommended. As spine experts, chiropractors have a strong interest in ensuring that children do not hurt their backs, necks, and muscles. Chiropractic doctors play an important role in preventative education and early detection as well as providing care for the treatment of backpack related injuries. At DiSabatino Chiropractic & Rehab, Inc, we are committed to helping our children grow up healthy and strong! If you have not had your child's spine checked recently or your child is experiencing any neck, shoulder, or back pain, call our office before starting school to prevent further issues once school starts. Please call today at 619-322-4626 to schedule your consultation and examination for your child, at no cost! Please take advantage of this opportunity and make sure your child has a healthy spine, and to correct any possible problems early on. What you do today to keep your loved ones healthy reaps great rewards later in life.Let's give our kids a great start to their school year! Celebrating Health Independence Month at DiSabatino Chiropractic & Rehab, Inc.
July Special – All New Patients $17.76! That includes Exam, Report of Findings & X-rays (if necessary). Very specific chiropractic adjustment with advanced muscle therapy is also only $17.76! As our country celebrates its Independence Day, we here at DiSabatino Chiropractic & Rehab, Inc. want to celebrate YOUR Life, Liberty and Pursuit of Good Health. We are celebrating Health Independence all month of July by offering all new patients the “Health Independence Package,“ which includes meeting the doctor, an initial evaluation and consultation, x-rays if necessary, report of findings and take home recommendation, a $295 value. Their first combination of very specific chiropractic adjustment with advanced muscle therapy is also $17.76. One of the great things about chiropractic is that it offers you so much freedom. Freedom from sickness and disease, freedom not to be reliant on pharmaceuticals, freedom to be able to live life pain free and be able to walk, hike, swim, golf, play with your kids, and live life to its fullest. Once you are adjusted regularly and have taken all the measures that you can to be healthy, you can be confident knowing that the innate intelligence of your body is expressing itself as perfectly as possible in keeping you healthy.